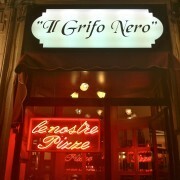 ” Il Grifo Nero” – is an osteria / tavern in Milan. ‘Grifo’ means snout in English and the restaurant uses a wild boar as their signature image. It is in via Solari 12. The interior decoration is mainly of wood and it does give you a feeling of traditional italian tavern. As their name and signature image suggest, their specialities are meat dishes. They have a huge variety of prosciutto (ham), such as prosciutto iberico (iberian), prosciutto di cinghiale (wild boar) , culatello ( a refined prosciutto made from legs of the pigs ), speck ( another kind of ham produced in north mountain area ), la bresaola di bisonte (dried buffalo meat), coppa ( ham from pig shoulder ), il salame di cervo ( vension cold cut ) and many more. 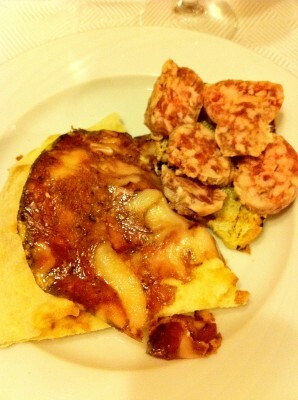 My favorite is the ‘focaccia con coppa’ (ham on white pizza bread ) and ‘crostini con salami’ ( toasted bread w/ sausage). When in season, they have wild boar (cinghiale) fillet or ragu style w/ spaghetti, ox (bue) steak or tartare, venison (cervo) w/spaghetti, hare (lepre)w/ pasta, veal (vitello) and lamb (agnello). For the past 2 years that I have been in Milan, this is the only restaurant I could find that served wild boar and ox (usually in winter time). Their wild boar pasta is extremely tasty. For the wine connoisseurs, they do have a wide selection of wines from regions all over Italy. Their price is quite reasonable with appetizers (antipasti) cost around €10 and first and second courses (primi e secondi) around €20 and dessert around €7. This is also one of the few restaurants that open in the month of August and also during festive season. They are closed only on Mondays. Their opening hours are 12:00 – 14:30 and 19:30 – 23:00. This is a medium size restaurant w/ about 80 seats so normally it is not necessary to make reservations except on special occasions like Christmas and Easter. Their tel no. is 02 48007104 and you can take the metro line 2 (green) and stop at S.Agostino (about 15 to 20 mins walk) or tram 14. 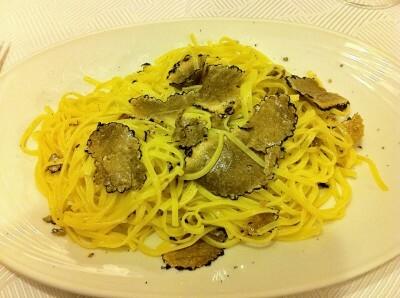 This entry was posted in Restaurants and tagged Il Grifo Nero, milan, restaurant. Bookmark the permalink. Great write up. I ‘m man always retweeted as well. I still check out how to design resolutions a background. Eventually, I get the best bg from your site. Thank you and I hope you will keep coming back! I would like to state amaze what a electrifying post. This is great. Keep doing your work!! My partner and i most certainly realize what you may now have thought. Essentially, When i read through your different web content but you may be thoroughly correct. Champion keeping this internet webpage. This page is awesome. We frequently encounter interesting things & diverse these. Appreciation for which records. Thank you and I am so glad that you have enjoyed my posts! hey there site owner, your web site page’s concept is normally impressive and additionally supporting the situation. Your current produces usually are beautiful. You need to sustain the beneficial deliver the results. Meets. We’re a newcomer to running a blog and in reality appreciated your blog post. My goal is to discover your web site along with keep on examining you. I absolutely need to give you thanks for telling your web web site. We are commonly towards blogging for cash and so i in reality thank you for content material. Released has really peaks my personal attention. I am about to bookmark your items your webblog along with always maintain looking for brand new specifics. Thank you very much and I am so happy that you have enjoyed my blog. I need to say, youve got one with the greatest blogs Ive seen in a long time. What I wouldnt give to have the ability to build a weblog thats as intriguing as this. I guess Ill just need to maintain reading yours and hope that 1 day I can write on a subject with as considerably expertise as youve got on this one! Thank you so much for your compliments. I am so happy that you like my posts and please keep coming back ! Great post, you have pointed out some great details, I too think this is a very excellent website. I thought this was an incredible browse through and i also 100 % learn the place you’re right from while in the 4 paragraph. Very good page, I’ll surely investigate the other sorts of content articles.